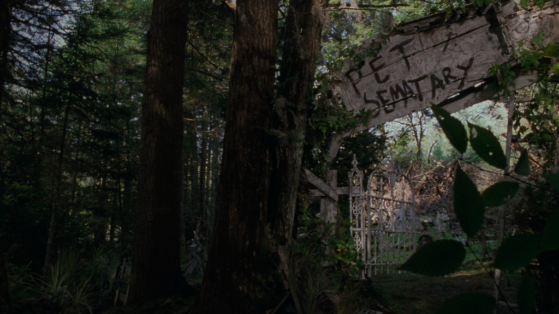 Pet Sematary is a 1989 horror film directed by Mary Lambert (Pet Sematary II, Tales from the Crypt, Urban Legends: Bloody Mary, & The Dark Path Chronicles). It’s based off the novel from the master of horror Stephen King (IT, Castle Rock, The Mist, Mr. Mercedes, & 11.22.63) who also wrote the screenplay. It’s the first time that he adapted his own work for film. Bruce Campbell was the original choice for the role of Louis Creed. George A. Romero bought the film rights in 1984 for $10,000 with producer Richard P. Rubinstein (Dawn of the Dead, Day of the Dead, Creepshow, Tales from the Darkside, The Stand, Golden Years, & The Langoliers) & he was the original director for the feature when it was first developed but he had to drop out when the production got delayed to work on another movie.The Ramones worked on music for the film since Stephen King referenced them in the source material. The budget was $11.5 million & it grossed $57.5 million at the box office. A sequel (II), a documentary (Unearthed & Untold: The Path to Pet Sematary) & a brand new remake have been made following this original production!!!! Louis Creed (played by: Dale Midkiff from Nightmare Weekend, Ed McBain’s 87th Precinct franchise, The Crow: Salvation, & The Magnificent Seven TV Series), a doctor from Chicago takes the job of the director of the University of Maine’s campus health service so he can spend more time with his family. He moves to a large house near the small town of Ludlow with his wife Rachel (played by: Denise Crosby from The Walking Dead, Ray Donovan, 48 Hrs, & Eliminators), their two young children Ellie (played by: Blaze Berdahl from DC Super Friends & Ghostwriter / Beau Berdahl from Strong Island Boys & Noel) & Gage (played by: Miko Hughes from New Nightmare, Kindergarten Cop, Full House, & Apollo 13) with their cat Church. They already start out with bad luck when they arrive there. They meet their new neighbor Jud Crandall (played by: Fred Gwynne from The Munsters, My Cousin Vinny, Car 54, Where Are You?, & Fatal Attraction) who has lived in the community his whole life. 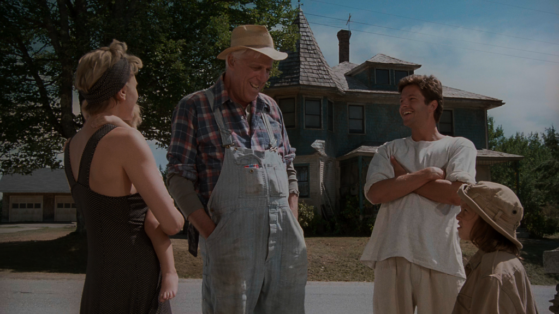 After getting to know them, Jud tells the family about the legend of pet sematary & walks them down the path of it. Louis & Rachel have a disagreement about discussing death with the children. She tells him the full story about her dying sister Zelda (played by: Andrew Hubatsek from Blue Steel & Human Resources) from spinal meningitis. Louis Creed faces his first serious situation at his new job when student Victor Pascow (played by: Brad Greenquist from Ali, The Diary of Ellen Rimbauer, Star Trek franchise, & The Chair) is rushed in after being fatally injured in an automobile accident. He loses the patient but something strange happens. Pascow is still talking to Louis. Church is found dead but Jud decides to help Louis avoid telling his daughter about the tragic death. He takes him to a secret location & tells him that he must bury his own pet. Louis does it without asking why & Church shows up the next day like nothing ever happened. Church is not the same cat as before. Louis confronts Jud about the secret location & what really happened to Church there. Jud tells him about the power of the ancient burial ground where the animal was buried. Months later, Gage is killed by a speeding truck & the family is a mess over it. They go away to Chicago to get their minds off of everything. Jud tells Louis about a story that involves a human in the same spot Church was resurrected & pleads with Creed to not do the same thing with Gage. Remembering what he did with Church, Louis stays home & decides to do the same for his young son. Desperate to get their life back to normal, he opens up a world of disaster for everyone around him. What will happen next? Can he make this unholy magic work to fix it all???? 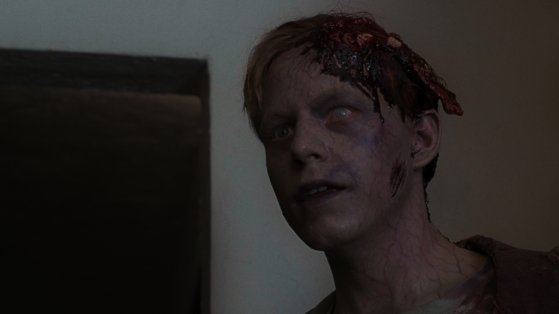 Pet Sematary is one of the best Stephen King adaptations ever made! The fact that this was the first film that King himself wrote into a screenplay from his own work tells you something. He was very hands on with this project & made sure it was done in Maine. Yes, it had differences from the original novel but King keep it close to it. I love how they went with a small & more unknown cast with this. It really sold the overall story & elevated the production value for it. Dale Midkiff, Denise Crosby, & Brad Greenquist were great in Pet Sematary. Miko Hughes gives one of the best child performances that I’ve ever seen in my life & he is very creepy towards the end. That role is very re-memorable & stands out from most of the other evil kids in cinema history. Fred Gwynne was amazing & it’s easily his greatest performance. Jud was my favorite part of this whole experience, I really enjoyed the character. He was the reason this all happened in the first place. I won’t lie, I couldn’t stand Ellie & I disliked Berdahl twins annoying performances but besides that I thought the whole cast were perfect for this. The special effects & music really added to everything, at the time it was exactly what this featured needed. As times goes on, I actually appreciate this version more & more especially after seeing the remake this weekend. 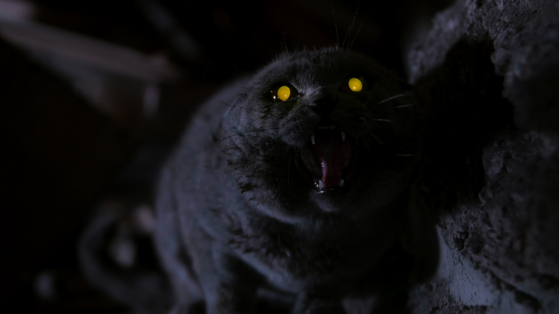 If you want to know more about this film plus it’s production, you need to check out the Unearthed & Untold: The Path to Pet Sematary documentary. As far as this release goes, it’s huge upgrade compared to all the others. I am so glad that Paramount gave a catalog title like this proper treatment. I am hoping the sequel gets a blu ray someday. HIGHLY RECOMMENDED!!!! Let’s talk about the high definition presentation from Paramount! This 2160p (1.78:1) transfer with Dolby Vision & HDR10 is major improvement over every Pet Sematary release in the past! I also want to mention in case you are not 4K capable yet that the new blu ray included with this release blows the original disc away in every possible way so whatever format is your preference this new 30th anniversary edition is worth adding to your collection ASAP! I thought the original HD presentation wasn’t anything special to be honest but Paramount went all out for this re-issue. So that’s at least one good thing about the remake being made, it got us a top notch transfer for this Stephen King classic. It’s damn near like watching it for the first time because it looks so much better now. I love technology because an old catalog title like this can be resurrected into primo condition. It’s loaded with a variety of audio options which includes English: DTS-HD Master Audio 5.1, Czech: Dolby Digital 2.0, German: Dolby Digital 2.0, Spanish: Dolby Digital 2.0, Spanish: Dolby Digital Mono, French: Dolby Digital 2.0, Italian: Dolby Digital 2.0, Japanese: Dolby Digital 2.0, Hungarian: Dolby Digital Mono, Portuguese: Dolby Digital Mono, & Russian: Dolby Digital 5.1 on this release. It’s never sounded better! All the dialogue is crystal clear, all the creepy moments are boosted, & the awesome music for the film is elevated here. If you still only own this on the old Blu Ray, VHS or DVD, you desperately need to upgrade this feature right now because this is the definitive version. It also has various subtitles which includes English, English SDH, French, German, Italian, Japanese, Portuguese, Spanish, Cantonese, Czech, Danish, Dutch, Finnish, Hungarian, Korean, Mandarin (Traditional), Norwegian, Romanian, Russian, Swedish, & Thai. 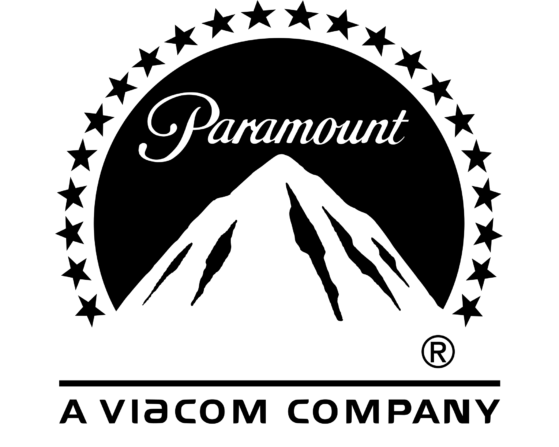 Paramount kills it again when it comes to the technical aspects!!!! Let’s discuss the special features from Paramount! It has an “Audio Commentary” with director Mary Lambert. She chats about the Monkey’s Paw tale that inspired the original story. She talks about author & screenwriter Stephen King. She brings up that they find the perfect house for the film but they had to move a tree to the location to make it work exactly like it was supposed to. She mentions the characters & what makes everything happen in this story. She talks about the locations, special effects, & cast. She says looks can be deceiving when comes to the bad & good angel of the story between a few characters. She mentions the influences of both of them & how it caused all these problems. She chats about some changes from the book & how difficult Cats were to train for the film. She thinks being friends with The Ramones helped her get this job since King was a huge fan of them. She brings up a earlier film that she directed before this & some similar tones it had. She mentions the editing & the people who put the movie together. She goes over various scenes & she has some nice stories about a variety of things here. She is still very passionate about this production & it really shows. She is soft spoken but gets excited when she’s chatting about the overall production.The UHD disc actually has all the new extras on it but the archival features are only available on the blu ray disc that’s also included in the set. 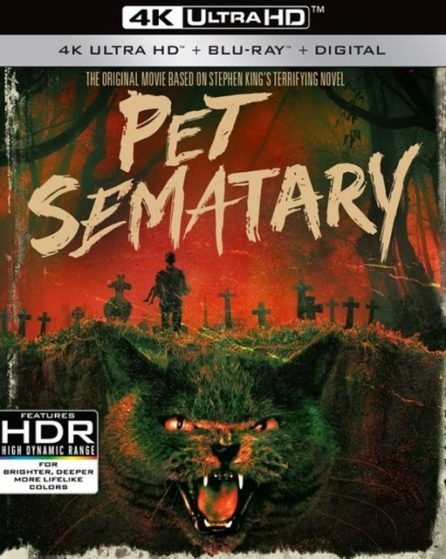 “Pet Sematary: Fear and Remembrance” is brand new & it’s a little over 7 minutes. It has interviews with directors Kevin Kölsch, Dennis Widmyer, actors Jason Clarke, Amy Seimetz, John Lithgow, & various members of the new production. It’s shows footage from the remake. They all talk about their experience with the original film & book. They tell personal stories from it that’s connected to their real lives. It’s basically a feature to promote the new film with some appreciation for the first film. “Pet Sematary: Revisitation” is brand new & it’s almost 10 minutes. It’s an interview with director Mary Lambert. She chats about how she got the job. She talks about the first time that she met Stephen King. She says that it was up to him on who directed this film. She brings up how important Miko Hughes performance was & how it made the film. She mentions working on the brand new restoration for this release & how it’s the best it’s ever looked especially compared to all the other releases. “Galleries” is brand new & it has all kinds of photos from the production. “Stephen King Territory” is a little over 13 minutes. It’s hosted by author & screenwriter Stephen King. It brings up the novel was on the shelf for years & King originally didn’t want to publish it. King tells some personal stories & how they inspired the book. He talks about the setting & the Maine locations. It has interviews with director Mary Lambert, actors Dale Midkiff, Denise Crosby, Brad Greenquist, & producer Richard P. Rubinstein. They chat about the source material & their experience on the production. “The Characters” is almost 13 minutes. It has interviews with director Mary Lambert, writer Stephen King, actors Dale Midkiff, Fred Gwynne, & Brad Greenquist. It goes into detail about each main character from the film & the actors who played them. Mary Lambert brings up that Dale Midkiff & Denise Crosby auditioned together originally. Their chemistry was there from the start & it helped them get the roles. She says it was very difficult to cast the children for this. She mentions that the cats weren’t easy to work with but they all had certain tricks or things they were good at. They bring up the performances. They chat about the production. They talk about Fred Gwynne writing children books besides acting. “Filming the Horror” is a little over 10 minutes. It has interviews with director Mary Lambert, actors Dale Midkiff, Brad Greenquist, & others. Mary Lambert recalls the day & what she was doing when she first got the offer for the feature. She chats about her collaboration with Stephen King. She said he was always available to consult when it came to creative aspects. 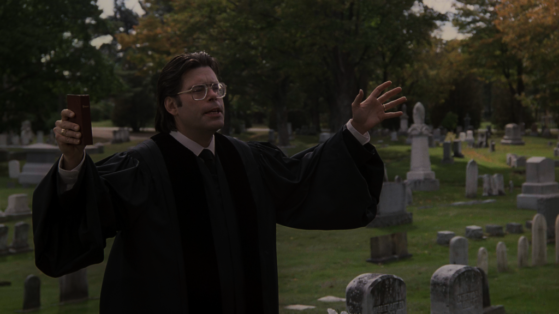 They bring up the author’s cameo in the film. They chat about some of the death scenes & how they were put together. They talk about being surprised how much success it had & that it still holds up after all these years. It has a slipcover, a digital code, & a blu ray release included. Don’t forget the remake was just released last weekend also. It’s available everywhere right now, CHECK IT OUT!!! !